Eliud Kipchoge: 12 x 800m, 10 x 400m …Please don’t try that. You’re not Kipchoge. 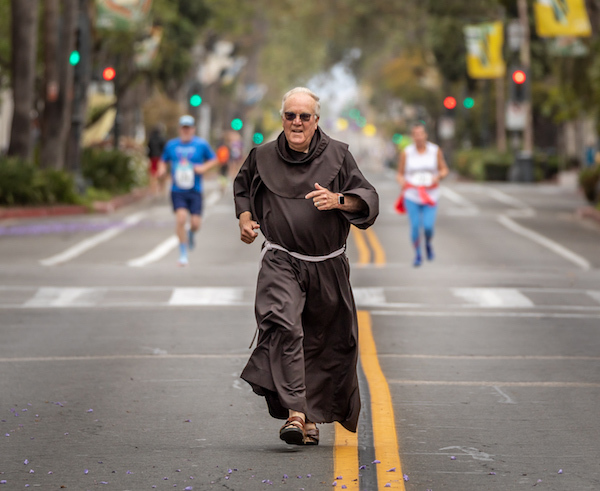 State Street Mile …Father Larry Gosselin from the Santa Barbara Mission jumped into the race as he walked by the start (Photo: Fritz Olenberger). From Santa Barbara Edhat. Gary Cantrell, famous race director, is walking across the country. Story. Video from last night at Hayward Field with Vin Lananna, Bill Dellinger, Lance Deal, Mary Slaney, others. Is Being Good Good for You? These 10 things all happened at Oregon’s historic Hayward Field. …Check the clip from Animal House, filmed in 1977. It looks very different today. Austin O’Neil goes 3:56 at the State Street Mile, first sub four by a Santa Clarita native. More. …Course details. …Race video. …Rich Burns, another Hart alum, ran a 4:19 in the 1500 when in his fifties. Jeff Sather, the OTC Masters coach, will give us a surprise session with 500 intervals. …Not fun. Ken Goe on Phil Knight, Hayward Field, etc. Serious Hayward devotees have this book. Great photos. Prose by Kenny Moore. How cool is this? We’re going. Costco Is a Performance Athlete’s Dream. …We’re here. Along with two other couples. Six aging adults. Each with an opinion, a position on Costco. Why your brain needs you to read every day. …On returning from Ireland, she asked me (being 44% Irish) for a book recommendation, wanting insight into Ireland’s soul. I suggested this. She’s reading it now. Loves it. …Available for free on your Kindle.